Skotte chose this shirt for today. I was surprised – Skotte is allergic to cats and therefore not a big fan of them. Understandable! However, I come from cat people and love cats a lot. 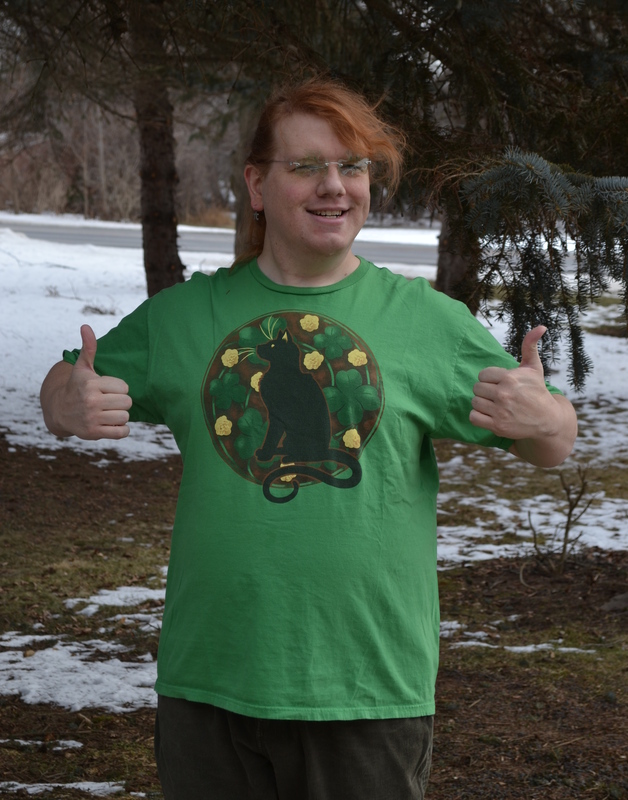 I think he chose the shirt more for the green and the shamrocks than the cat – but maybe I am converting him! Weirder things have happened! When some people think of St. Patrick’s Day, they think of green beer and lots of drinking. Maybe Irish dancing, which seems to be quite popular here in Rochester. I think there are several dance schools here now. It’s exciting! I think of Irish fiddle music! When I was in college, one of my professors invited me to play some fiddle tunes with him for St. Patty’s day gigs. It was a LOT of fun. I love traditional folk music and fiddle tunes of a wide variety. Crank up some Irish tunes and have a great day!